Here in South Carolina August is pretty much the dog days of summer. It’s been hot up until now, but this is the month things really kick into high gear. As in highs in the upper 90s to low 100s with humidity to match. I vividly remember being very pregnant with Jack in August of 2007 which had 14 days of 100 degrees or hotter! It’s miserable. We are inside most of the time, only working in the garden and playing outside first thing in the morning. It’s days like these that call for frozen treats. I’ve managed to keep everyone away from ice pops so far this year, Josh and school have helped hook the boys on those in the past. These are a healthier option and incredibly easy to make. All it takes are some ripe bananas, cocoa powder and plain yogurt. Blend it all together and freeze. It doesn’t get much easier, and healthier for that matter. The kiddos get fruit and dairy, win win for me. We may need to make these very often this month just to stay cool! Combine all ingredients in a blender and blend until everything is well combined. Pour into molds and freeze. 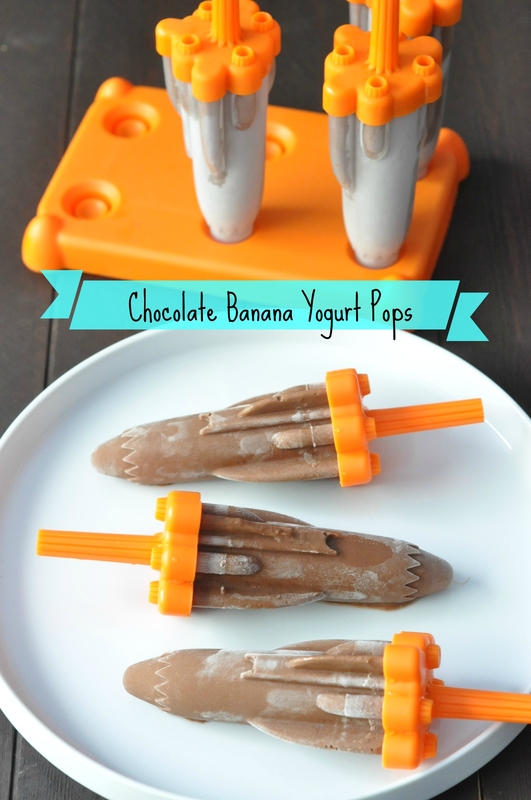 This entry was posted in Dessert, Snacks and tagged easy, frozen treat, kid friendly, popsicle, summer treat on August 6, 2015 by Gretchen. Chocolate and banana anything is excellent in my book! What a fantastic healthy summer treat! I just happen to have some bananas on the way out. Can’t wait to see what my kiddos think 🙂 Thanks for sharing! My kids loved these pops, hopefully yours will too. Bananas are great since they are naturally so sweets especially when over ripe. 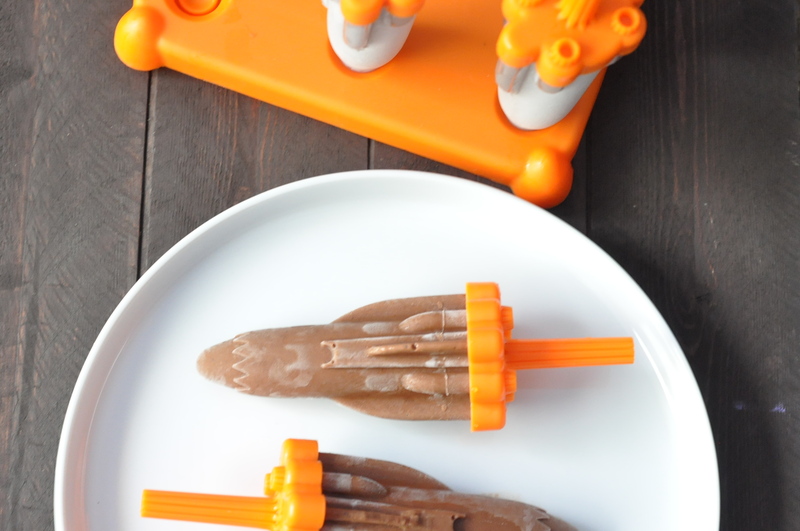 They are pretty groovy molds! Bananas are SO versatile and one of the few fruits they haven’t managed to process, pack in plastic and sell back at a 1000% markup. The boys certainly love the molds. Mothers may or may not be very loud rocket sounds and launch patterns while they eat these! The boys will finish them off after a thing outing this afternoon! Yes I am sure! and they look so yummy! You know what I love about your recipes? simplicity. Simple has always been my magic word. I shall ask my daughter to make some. They look very pretty!!!! I’ve gotten a lot simpler with cooking since having three boys! I still like complicated or fancy recipes, just not very often.